Without a traditional transmission, 273 lb.-ft. of low-end torque has nowhere to go except to the tires and pavement. And with the ability to hit a test-track speed of 100 mph, it all adds up to show how a vehicle with an electric propulsion system can feel so powerfully exhilarating. 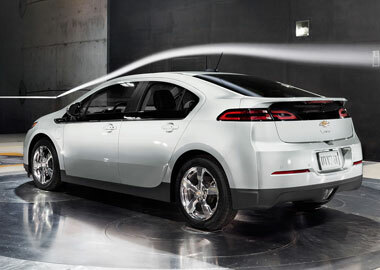 Volt takes gas as well as electricity, but don’t think you’ll be spending much time at the pump. On a full charge, Volt can get an EPA-estimated 38 miles gas-free , and Volt owners who charge regularly average 900 miles between fill-ups. This isn’t just a car for the commute. When the gas-powered generator kicks in, producing electricity to power the engine, the range of Volt extends to an EPA-estimated 380 miles with a full charge and a full tank of gas. Let’s not forget what is truly important. Volt provides you with an exhilarating drive. 273 lb.-ft. of torque, a track-tested top speed of 100 mph and four versatile driving modes make it clear that driving electric doesn’t mean sacrificing performance. Volt utilizes a closed grille to help slice through the air. Aerodynamic exterior elements include mirrors, a closed grille, rocker panels and the rear spoiler. Just like the exterior, Volt has an interior with a flow of its own. This unique cockpit-inspired design incorporates a full center console and four sporty bucket seats. Surrounding the passengers are the latest innovations. There are two interactive 7-inch diagonal color LCD screens: the Driver Information Center behind the steering wheel and the center panel touch-screen with efficiency feedback, driving mode selections, available rear camera display and entertainment options. The interior color combinations are striking. Choose from standard Premium Cloth in Jet Black or Pebble Beige, or take advantage of the available heated leather-appointed seats, sharply styled in Jet Black with Dark Argent or Ceramic White accents, or Pebble Beige with sueded inserts. Inside, there’s a place for everything: cup holders, storage bins, door panel storage, and even little bonuses like the umbrella pocket and a space for the standard 120V charging cord. Get incredible sound from an available seven-speaker Bose® audio system with subwoofer that’s 30% smaller, 40% lighter and uses 50% less energy than comparable Bose® systems. When it comes to safety, there’s no mistaking that Volt has raised the bar. 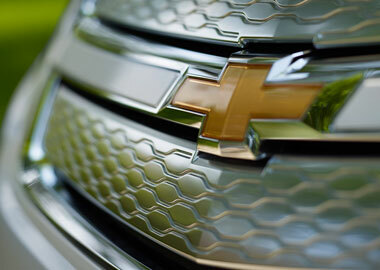 The 2014 Volt received a 5-Star Overall Score for Safety from the National Highway Traffic Safety Administration. This accolade speaks volumes. Your drive begins with the aid of an available rear vision camera that alerts you to certain obstacles when traveling in reverse at low speeds. With available Forward Collision Alert, a forward-facing camera alerts you of slowing vehicles while available Lane Departure Warning monitors lane markings and warns you if you are drifting out of your lane without signaling. When you reach your destination, available Park Assist will help you park your Volt, finishing your trip stress-free. OnStar® is standard for three years. Volt automatically relays crucial information to the OnStar® Command Center via OnStar® Automatic Crash Response. There, trained OnStar® Advisors utilize GPS technology to pinpoint your exact location and can request that assistance be sent right away – even if you’re unable to respond.